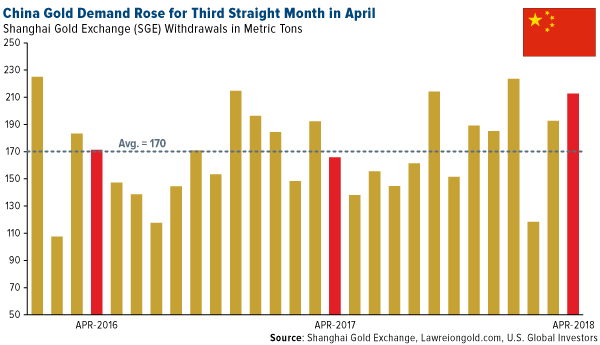 Another week’s gold withdrawal figures from the Shanghai Gold Exchange (SGE) and it appears that the demand momentum is holding up – if not accelerating. The latest figures are from the week ending August 14th with the Exchange reporting flows of 65.3 tonnes out . This is an enormous figure for an August week when historically Chinese demand is usually at its lowest and follows several weeks of plus 50 tonne withdrawals at a time of year when 30 tonnes would normally be seen as a strong figure. 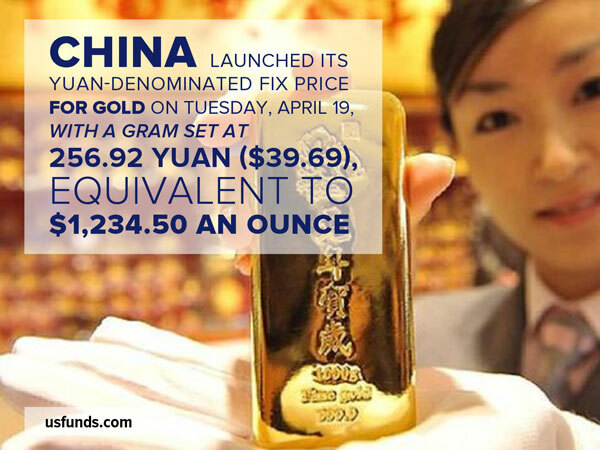 There are reports that demand has slowed over the past week given the recent recovery in the gold price, with Shanghai premiums falling accordingly, so the next week’s withdrawal figures will be viewed with additional interest to see if this really is the case, or whether Chinese overall ‘demand’, as expressed by SGE is still holding up well. 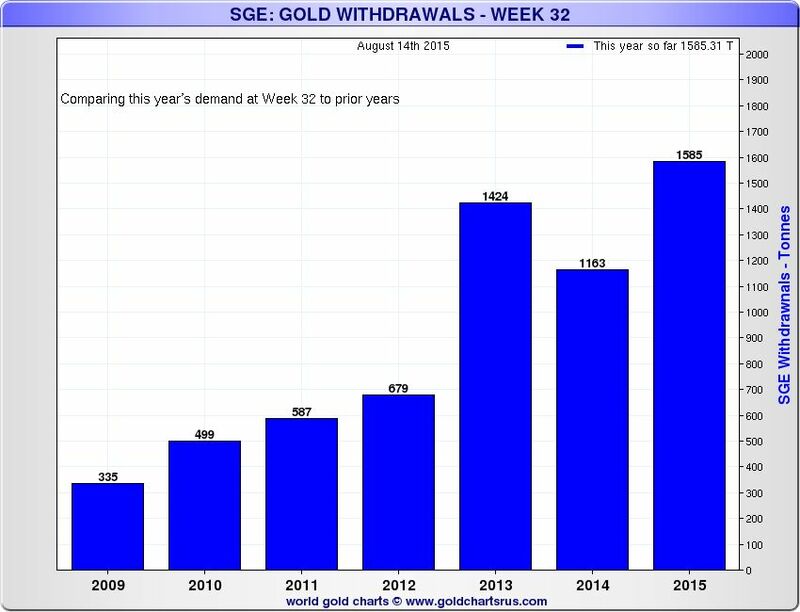 The latest figure for total SGE withdrawals for the year to date is now a massive 1,585 tonnes, fully 161 tonnes more than in the record 2013 year at the same time – see www.sharelynx.com chart below. A quick calculation of SGE withdrawals to date (close to 50 tonnes a week so far this year), if extended over the full year would suggest a total figure for 2015 at over 2,500 tonnes – hugely higher than the record 2013 figure of 2,181 tonnes. While one should perhaps regard a continuing weekly withdrawal rate of 50 tonnes as being an optimistic projection, it is also worth bearing in mind that SGE withdrawals are usually far stronger in Q4 than in Q3! With the Chinese Central Bank now reporting its own monthly gold accumulations – 19 tonnes in July and these apparently are additional to the SGE reported figures, and Russia continuing to expand its gold reserves – another 12 tonnes in July – and Indian imports rising sharply according to latest Swiss gold export data, global physical gold demand appears to be running well ahead of new mined supply, although whether that makes any difference at all in a paper-gold futures led market is perhaps doubtful. But with fear stalking the Dow after a huge week of falls (around 530 points on Friday alone), and general stock market indices around the globe a sea of red, maybe at last gold sentiment is beginning to get a safe-haven boost with worries about a general worldwide stock market meltdown. Is gold demand/supply balance crunch already here? 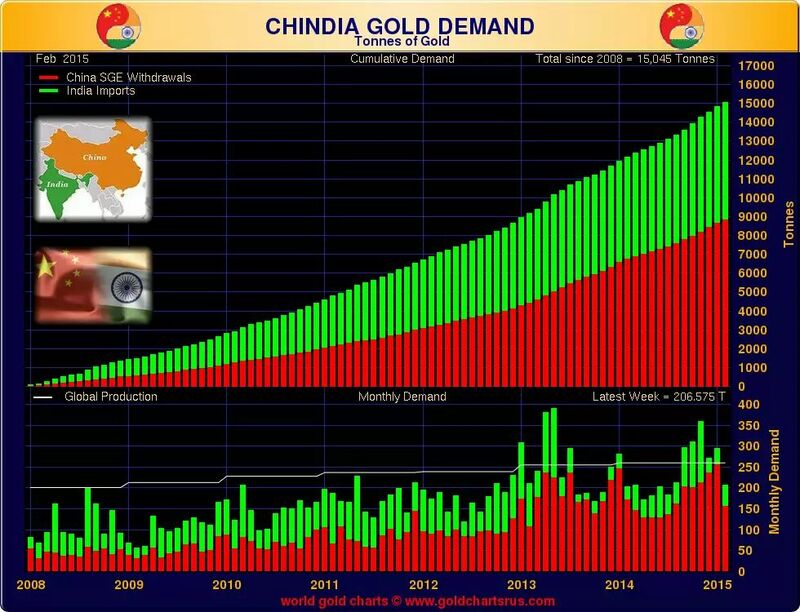 We are indebted to Nick Laird (www.sharelynx.com and www.goldchartsrus.com) for the fascinating chart reproduced below which shows the cumulative gold demand from China and India (represented by SGE withdrawals for the former and gold imports for the latter) which demonstrates in graphical form just how much gold these two Asian giants have been accumulating over the past seven years. Note specifically the lower chart section month-by month figures, which also shows global gold new mined production, which demonstrates that since the start of 2013 monthly gold demand from the two nations on their own has exceeded global production on no less than 10 monthly occasions – and sometimes very comfortably so. 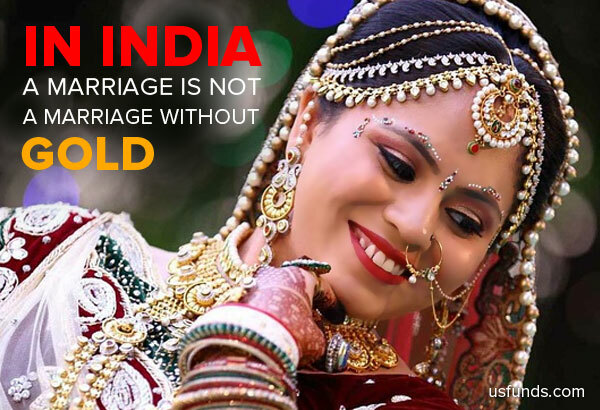 Overall it suggests that China and India between them are accounting for virtually all gold’s new mined supplies. The chart also shows the inexorable rise of China’s gold consumption to overtake India in 2013 as the world’s leading gold consumer – India had held this position for many years beforehand. It can be seen how Indian imports fell away so sharply during 2013 when the then Indian government imposed significant gold import duties and introduced other measures to try and control the very substantial gold flows into the nation to counter the significant effects Indian gold imports had been having on its Current Account Deficit. 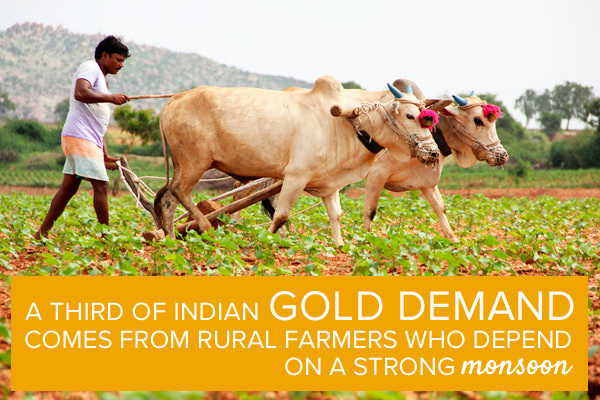 It may be seen though that since last year Indian gold imports have been beginning to pick up again despite the 10% import duty imposed. Given that China and India are not the only net gold consuming nations – the World Gold Council suggests around 545 tonnes was consumed by other nations last year – and that some central banks, notably Russia and Kazakhstan, have been taking gold into their reserves month in, month out amounting to 477 tonnes last year and one may well ask where all this gold is coming from. Scrap will account for most of this. Overall, scrap supply last year was largely balanced out by the central bank purchases plus other nations’ demand. But scrap supplies have been falling along with the gold price and if China and India keep on absorbing gold at the current rate. 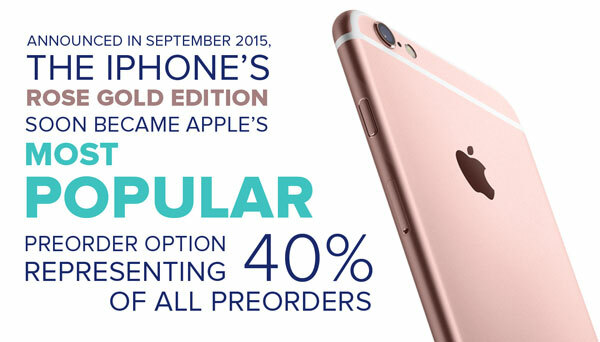 Then demand will be exceeding apparently available supply so where will this come from? 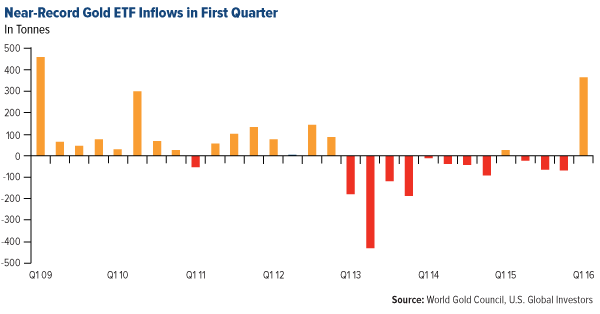 ETFs could be a source, but at the moment sales out of and purchases into these seem pretty much in balance. Ed Steer in his Gold and Silver Daily newsletter www.caseyresearch.com/gsd says that any balance o f global demand over supply must be coming out of Central Bank vaults as the only other available unaccounted-for source. It is hard to disagree with this suggestion but this would presumably be in leased gold which enables the banks to keep it in their books, although in reality the chance of this ever being repaid as bullion look increasingly slim, given the physical gold flows into firm eastern hands. 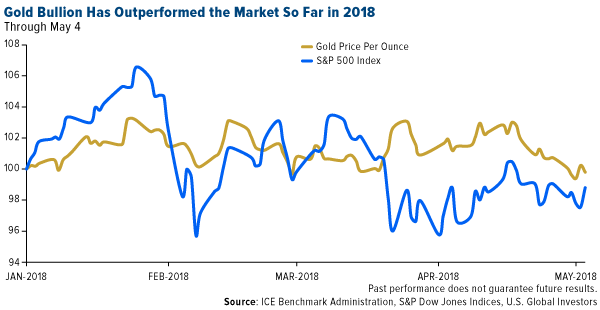 With the overall trend of gold accumulations by China and India together continuing to rise alongside incomes and middle class growth, we have to be getting pretty near the crunch point at which there is a serious shortage of available physical gold – some think we are there already. 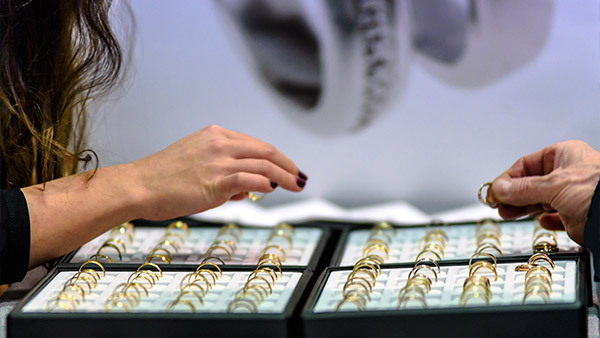 Whether gold prices can be controlled at current levels under these circumstances will become increasingly difficult. And with China in particular seeking to tie down more gold supplies through Chinese company acquisitions of, and major stakes in, other gold producers outside their own country and creating gold-positive initiatives like its proposed $16 billion ‘Silk Road Gold Fund’ it’s hard to see the gold price being held down within its current trading range much into the future.